Mozambican Land, Environment, and Rural Development Minister Celso Correia has defended the need to preserve biodiversity and protect the environment in Mozambique. The minister was addressing the core ceremonies to mark International Forestry Day in the country’s historic Gorongosa National Park, in the central region of Mozambique where he said uncontrolled bush fires and poaching were his government’s key challenges in the management of forestry. In addition, Correia says the other challenge is the indiscriminate destruction of trees for timber, firewood and charcoal. The minister said various actions were underway to ensure the sustainable exploitation of forestry resources in Mozambique. “We have, as government guidance, to promote sustainable development at all levels, and forest management is part of this programme,” Correia said. “One is the growing need for food production, forest areas for food and we have to prepare ourselves and work institutionally to make sure that our wealth, this treasure of ours, continues to serve the Mozambicans of today and of tomorrow. We have to have the awareness of the value that this ecosystem has. And there values of life that exist in the relationship that man has had with this ecosystem called Gorongosa. 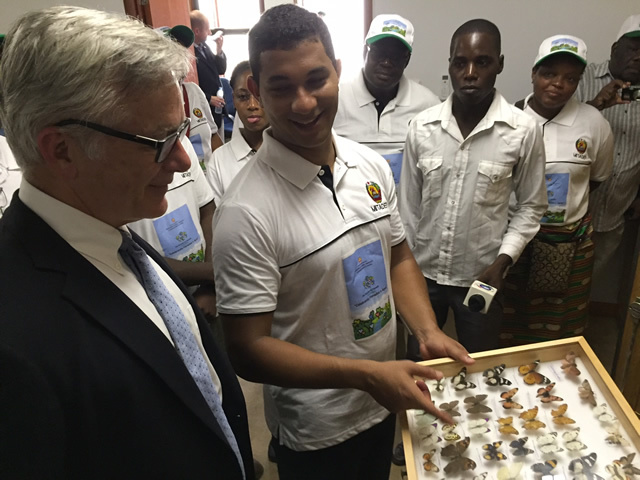 We also want to promote it so that more Mozambicans can gain awareness of the importance of this ecosystem,” he said. 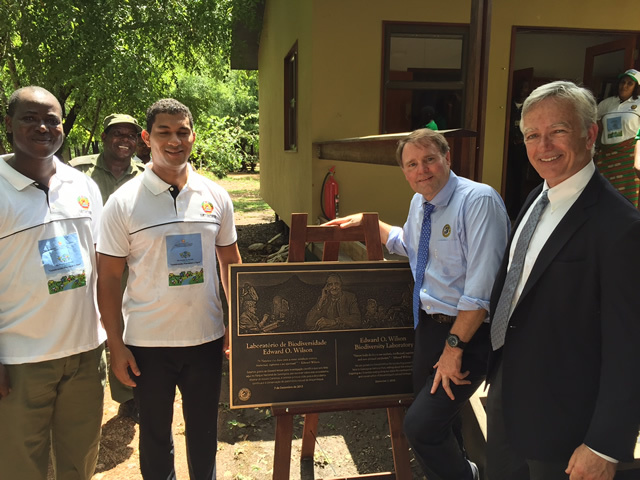 Greg Carr (in blue), President of the Gorongosa Restoration Project and member of the EOWBF Board of Directors, poses with the dedication plaque for the E.O. Wilson Biodiversity Laboratory.